You want to know something kind of embarrassing? I’m a Jew who grew up just outside of the city and not once had I ever eaten at Barney Greengrass until last week. Alec Baldwin & Richard Blais would be so disappointed. Over the years, I’ve definitely gotten a taste of their infamous sturgeon and smoked fish at Yom Kippur break-fast, but it’s not in our regular rotation. What can I say, my family has always been a Zabar’s kind of family. I called my Grandma (who you might remember from Grandma’s On The Town) to get schooled on a little Greengrass back story. Thanks Grandma. 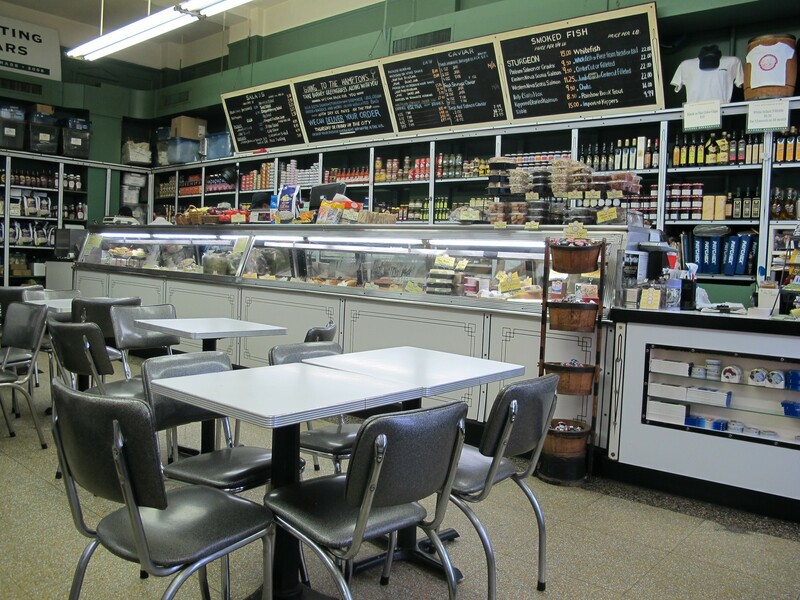 Barney Greengrass is the definition of a [perfect_for slug =“classic-nyc-establishment”]Classic NYC Establishment[/perfect_for]. What’s not to love about a 100-year-old tradition of sturgeon scrambled eggs and a H&H; bagel with lox, cream cheese and tomato? Every New Yorker, regardless of religion or background, will appreciate this place. You can eat in or take out, but either way you should bring cash and prepare to be treated poorly. It’s beautiful. H&H; bagels aren’t as accessible as they used to be. Take full advantage at Barney’s. Toast one up and top it with cream cheese, tomato, onion, and lox. Heavenly. Eggs scrambled with onions and one of their famous smoked fish is the house specialty at Barney’s. For the white fish lover, go with sturgeon. For those who’d like a saltier, brinier alternative, go with smoked nova salmon. Either way, it’s awesome. You’re not allowed to come to Barney’s and NOT order sturgeon. Just get a plate to share - it’s only $17 for four slices of smoked white fish. Bargain! Tastes even better on top of a bagel. I’ll be honest, we’ve never had them. But people generally freak out over them, so if you come on a weekend, which is the only time they’re available, definitely order these. Usually orange juice wouldn’t get it’s own food rundown write-up, but this OJ is really good. Since I don’t drink coffee (crazy, I know), I’m a big time orange juice drinker and this glass of fresh squeezed was top notch.